Why Pay Day Takes So Long to Come. Zeno’s Paradox. My 41 Year Old BMW Hits the Road. There’s a philosophical reason why payday always seems so incredibly far away. To disrespectfully borrow from the Greek philosopher Zeno it would go something like this. Today is Monday and payday is Friday. For me to get to Friday I have to get half way there, say Wednesday. And for me to get to Wednesday I have to get half way there, say Tuesday. Maybe you see where this is going. For me to get to Tuesday, I have to get half way there, which is about 4 pm today. Then there’s half way to that, and half way to that. In other words, there’s an infinite number of half “times” I have to reach before payday. May not be scientifically true but it certainly explains psychologically why payday always feels as if it will never come! It’s Monday morning and as usual it looks like payday will never come. I’ve got to go to work. I stare mournfully at the back tire on the Road King (AKA Big Red). I have almost 9000 miles on that tire and there’s an angel hair’s width of tread still on her. I’ve needed a new one since El Paso, Texas, almost 2 months ago. Harley whitewalls aren’t cheap. About $300 installed. There’s 4 days until pay day when I can get it replaced. I like to pay cash. And it’s the same 4 days on which I have to make the 100 mile round trip to Dalton, where I work. 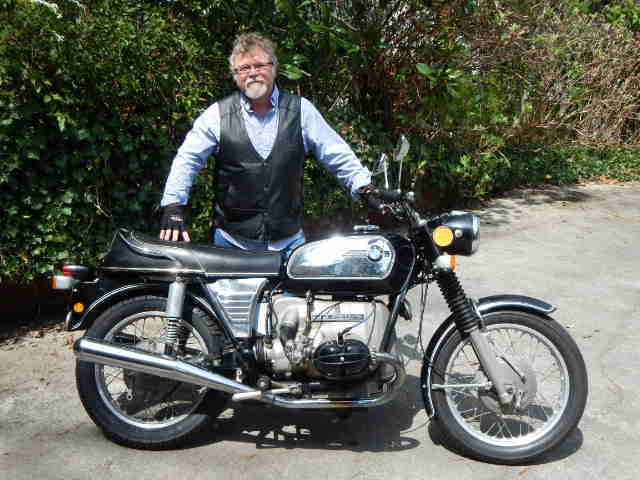 I was out in the garage staring at Big Red’s back tire, shaking my head when the Old Knight, the 1973 BMW R60/5, whispered to me to let her out of the cage. She could do the run up to Dalton she promised. I tilted my head and stared at her. I had been riding her around town for the last year and she’s done alright. She’s had a few problems but nothing you couldn’t work through or around when you ride her. The thing is that she’s 41 years old. She has four speeds, a 599cc engine (Big Red has five and most new bikes six) and doesn’t have a windscreen. She has Mikuni carbs on her which work far better than the custom Bing ones. (“Why do they call Bing carburetors Bing? Because that’s the sound they make hitting the trash can.”). Why not give the Old Knight a try? There’s nowhere to stash the coffee thermos and no saddlebags so I just “bungeed” my laptop bag to the seat and took off. She handled beautifully as she always does. Engine’s quiet and she just thumps along. The acceleration’s not fast but it is consistent. After a while I relaxed and just enjoyed crossing the rivers and watching the mist rising in the hills and mountains. But then I hit Interstate 75 for my last 20 miles. Cars and trucks whizzed by as the bike slowly gained speed. She was straining, but happy and still had more throttle left when I got her to 80 mph.That’s when the problem with the tachometer needle started. These old BMW’s are notorious for having bad speedometer/tachometer units. For the last month my rpm gauge has acted like a metronome with its needle flipping right and left. Now it started going wild. For a while it ran all the way to the right and stuck in the red zone like I was redlining it. It remained stuck there all day Monday. On Tuesday the rpm gauge tip finally broke off and the base of the needle began spinning around like a fan or like the newspapers hot off the press in those old movies. Slightly mesmerizing if you stared at it, so I just didn’t. Besides, who needs an rpm gauge? My Harley didn’t have one. On Wednesday a loud whirling sound, related to the engine speed, started coming out of the headlight unit, where, of course, the speedometer/tachometer is located. On the way home the speedometer needle started bouncing around like it had the hiccups. One moment it showed I was going 40mph and the next moment 80. It finally settled down and stopped, showing me riding at a cool 120 mph. Thursday morning, one more day to go,and the Old Knight put her brave face on again. Who can resist the pleading grin from that shiny chrome toaster tank? I strapped on my laptop bag, cranked her up and rode her down the driveway and out to the main road. That’s when the clutch started slipping. I managed to turn her around and ride back up to the house but the clutch kept slipping and she couldn’t make it up the driveway. I parked her on the street, grabbed my backpack and sped out on Big Red, fearing I was going to be late for class. I was there 2 minutes early. When I got home, after parking Big Red, I went down to tinker with the BMW. I got her started, took her for a spin and then managed to ride her back up the driveway to the garage. There she sits, proud but with a slightly burnished ego. Friday, I drove Big Red down to the Harley dealer and had a new tire put on the rear. The next repair work will be on the Old Knight, next pay day, of course that’s if it ever comes.